Nov 1-30 “Recommended” Songs Considered for P2P Luncheon. Congratulations to the writers below who had songs recommended between November 1 and November 30 for consideration for our Publisher Luncheon. These were submitted to the Song Evaluation Service and were recommended by the NSAI Evaluators who reviewed them. NSAI staffers will review all songs recommended between August 1 and December 31 for consideration to be played at our January 2016 Publisher Luncheon. We will choose up to 15 songs and they will be played for our publisher and industry guests in January 2016. Be sure to take a look at the hometowns of these great writers. Who knows… you may find your next co- writer! With NSAI members from all over the world, one of these folks might live just around the corner from you! *Names listed above do not reflect writers who have had songs recommended at any time other than November 2015. Want to share with your friends that you've been recommended in this month's EARS?! 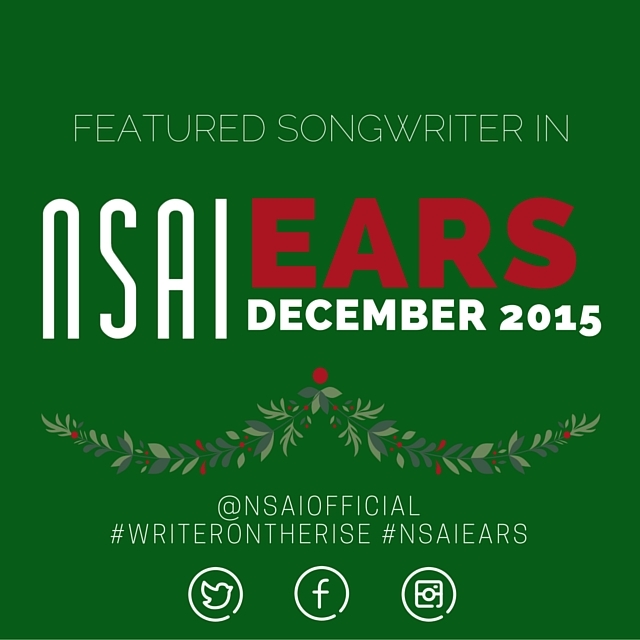 Share the link: http://bit.ly/EARSDecember2015 and the graphic above on Instagram, Twitter and/or Facebook and mention us @NSAIOfficial! Be sure to use the hashtags, #WriterOnTheRise and #NSAIEARS. Congratulations!! !